The metaphysical properties of the stones are mostly based on the type of formations and the shape of the crystals. There are many viewpoints in the world about this topic, so you must keep an open mind to sift through them to find your truth or what works best for you. Sometimes what is right for one person may not necessarily coincide with what is best for another. People are different, their energy patterns differ, and this relates to the way in which the stones and quartz crystals work with them. Crystal formations are also alive within the mineral kingdom, which evolves at its own pace. This means that as changes occur in the mineral structures, there are variations in their energy patterns, so people continue to discover new energies and uses for their crystals and stones. This is particularly true with most crystal healers and magical practitioners who are sensitive to these energies and they know when to use one stone or another. There are many different varieties of quartz crystals, several of which are semi-precious gemstones. Since antiquity, the varieties of quartz have been the most commonly used minerals in the making of jewelry and hard stone carvings. Pure quartz, traditionally called clear quartz or rock crystal, is clear and colorless. But there are other colored varieties which receive a different name. Among them we find: amethyst, citrine, ametrine, rose quartz, smoky quartz, milky quartz, rutilated quartz, tourmalated quartz, and others, depending on the aggregates of crystals or the mineral inclusions. There are other opaque gemstone varieties of quartz with mixed rocks that create awesome contrasting color patterns. Among them we find agate, carnelian, onyx, jasper, and other varieties. 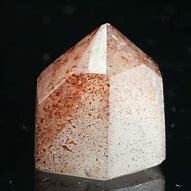 ABUNDANCE QUARTZ is a rare type of quartz, composed of a “host” or “mother” crystal point with at least nine other smaller points (single or double-terminated) situated vertically around the base. 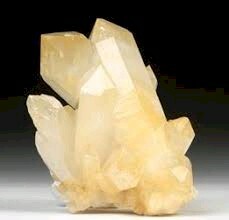 Abundance Quartz is used to assist our efforts to securing one's future. Abundance crystal is a source of regeneration and growth, with abundant universal life force that causes like to attract like. They can also be used as a talisman to foster fertility in homes where children are desired, or in gardens to grow flowers or bring crops. 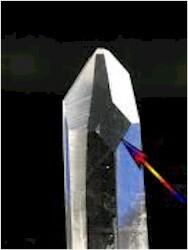 ACTIVATION QUARTZ (Time-line crystals) are recognized by an inclined window, which is similar, but less symmetrical than the main window formation. It can be located on either side of the center face. When located to the left side, it is said that it increases the left brain function, and when to the right, the right brain function. When referred to as “time-line” quartz, this means that its properties are considered in terms of past and future. Left is said to give access to impressions from the past, and right the future. AMETHYST is a beautiful violet variety of quartz crystals that ranges from a bright to dark or dull purple color. Sometimes amethyst and citrine are found growing in the same crystal and is called ametrine. Amethyst is considered a healing stone for spirituality and protection that connects to the Divine and brings clarity of the mind. Purple amethyst has represented power through the ages. Carved, polished amethyst stones and gems were used by the Egyptians all the way back to 4000 BC, and in ancient times there was a believe among the Greeks that this stone would protect its owner from intoxication or drunkenness. 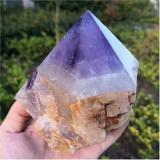 Amethyst crystals stimulate the crown chakra. It is widely used as an aid in meditation, helping you to relax and calm your thoughts to elevate your vibration. ANGEL AURA QUARTZ is a clear quartz crystal bonded with platinum and silver, sometimes even gold, or with traces of other metals that impart them a particular color. This stone exhibits a white and light blue rainbow colors with a silvery iridescence that reminds us of the gossamer wings of angels. It carries a very loving and sweet energy, stimulating the spirit and elevating one’s mood. 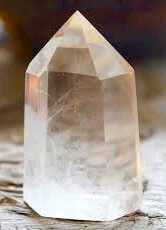 Meditating with this crystal allows one to enter a state of serenity and peace, purification and rest. 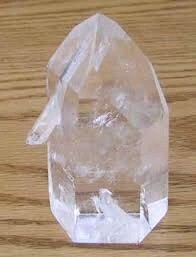 Angel quartz is an excellent crystal to channel communication with your angels and guides. It is an extremely rare stone and a real treasure if you find it, but beware of the faked Angel Aura stones which are man-enhanced. ANGEL PHANTOM QUARTZ, also called Amphibole quartz, is a milky-white quartz that contains reddish or yellowish incursions of hematite or other minerals. Angel Phantom Quartz crystals have inclusions that resemble angel wings, hence its name. Metaphysically, it is believed to shield someone from the abrasiveness of others and is especially helpful to those who have been emotionally or verbally abused. 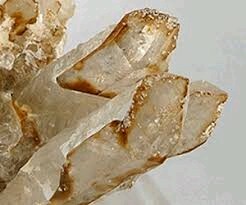 BARNACLE QUARTZ, also called Fairy Dust Quartz, is a type of crystal that has several smaller host crystals attached, covering some parts of the main one. Barnacle Quartz is mostly used for meditation, or as an aid in relationships when you are trying to refocus on yourself and your own life. It reminds the user to keep perspective on the self without getting too confused with whatever is happening around. Use this crystal in your meditation if you feel disoriented or lost, or are having doubts about your future direction or pursuits. BLACK TOURMALINE QUARTZ, as its name indicates, it's a quartz crystal with inclusions of black tourmaline needles. This crystal relieves fears and gives a sense of power and protection that makes you feel more secure. Black tourmaline quartz crystals are mostly used as personal talismans to carry in your pocket or to make into a necklace. They are also considered to be powerful healers against negative energies, and can actually turn back an evil spell cast upon you. 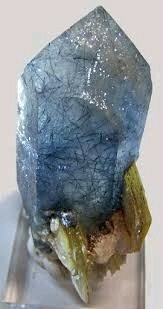 BLUE TOURMALINE QUARTZ, as its name indicates, it's a quartz crystal with inclusions of blue tourmaline needles. This type of quartz crystals fosters feelings of respect, compassion and discretion. They teach us grace, sensitivity to the needs of others, and tenderness in our charitable dealings. Blue Tourmaline quartz crystals are rare and they are mostly used as personal talismans or as a pendant. BRIDGE QUARTZ refers to a smaller crystal growing out of another one in a right angle (as shown on the left picture), with the base of the smaller crystal inside the larger, but most of the smaller outside the larger one. Bridge Quartz is mostly used to meditate and for spiritual healing. 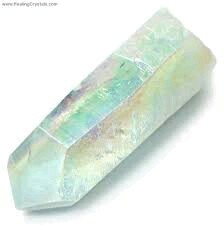 Healers sometimes combine this crystal with other specific stones to use them as facilitators and conduits. 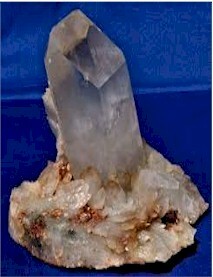 If the smaller crystal extends from the larger one in both directions, and part of it is completely enclosed within the larger, it is not a Bridge Quartz but a Penetrator Quartz (See top, right). 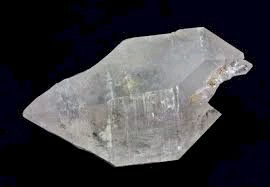 BUDDHA QUARTZ is a crystal quartz with a phantom inside that looks like a sitting Buddha viewed through the main facet. It is considered to be a stone of peace and enlightenment and therefore good to use in meditation and spiritual practices to seek illumination. BURR QUARTZ is an awesome three-dimensional crystal cluster. They are powerful energizers and multi-directional amplifiers of the life force. The best specimens would have no center matrix and points radiating from the center only. 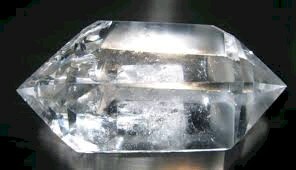 A Burr has no base, no limits, and no restrictions, so this crystal represents freedom, joy, learning, expansion, and growth in all directions. Burr quartzes are used in Feng Shui to place in difficult corners of the home or office, with restrictions that may be affecting the healthy flow of energy to redirect the Ch'i and amplify it. CATHEDRAL QUARTZ is a rare type of quartz, which consists of one prominent point with parallel points stepping up around all sides. 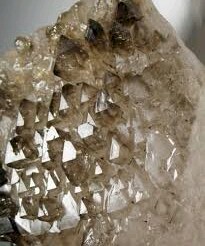 It is usually an opaque crystal formation with a main central point, surrounded by parallel ones in different widths and lengths but shorter than the main crystal, and all of them growing on a common base. It is said that Cathedral Quartzes connect with the Akashic records. They are rare to find but very valuable because they are believed to contain universal knowledge. If you seek wisdom and enlightenment, or if you are a dedicated seeker of universal truths, this is an excellent crystal to use in meditation. CHANNELING QUARTZ CRYSTALS, also called Channeler Crystals, help you access higher wisdom, either in the form of your Higher Self, your Spirit Guides, or of Angels. They have a seven-sided facet flanked with two smaller three sided ones, opposite a three sided one. These are powerful crystals with a strong energy, and they assist you to use your inner wisdom to connect to the spirit world. There are 434 different types of channeling crystals and each one of them will connect you to a the corresponding devas or angelic builders within the Spirit world. CHISEL QUARTZ are relatively flat, but have a wide beveled face or faces that look like a chisel. They help focus and amplify the personal power to keep separated from bad environments, people, and influences you wish to remove from your life. These are specialized formations frequently used by spiritual healers to perform “energy surgeries,” which consist in separating from the vital body or light body harmful energies which are destructive to balance and wellness. When ordinary healing efforts are ineffective, the use of chisel quartz by specialized healers can often bring the needed relief. Some people like to use them as personal talismans in an effort to correct bad habits, but these are powerful crystals not to be used indiscriminately. 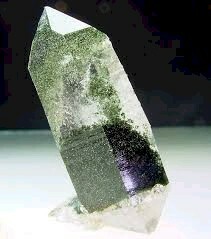 CHLORITE QUARTZ is a type of quartz that contains green chlorite inclusions, which refers to a group of minerals, not a single mineral. 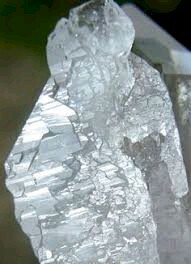 Chlorite Quartz creates an internal structure in the crystal that gives the crystal powerful guardian powers, as well as physical strength and growth to the crystal. 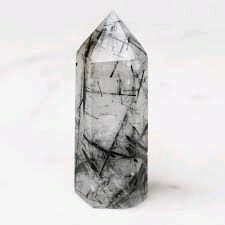 Use Chlorite Quartz as a healing crystal to promote vigorous growth after an injury that causes a period of inactivity and strength needs to be regained. CHOCOLATE QUARTZ is a type of quartz that has some edges darkened by hematite, and there are specimens much darker than the one here shown. 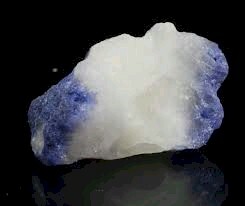 It is used as a meditation crystal for increasing optimism and overall contentment with one’s lot. When we see the world with a dark future, this quartz formation teaches us to look beyond the darkness to see the light of truth and keep our balance and hopes. CITRINE is a variety of quartz whose color ranges from a pale yellow to brown due. Sometimes citrine and amethyst can be found together in the same crystal, which is then referred to as ametrine. Citrine has been referred to as the "merchant's stone" or "money stone" because it is said that it brings prosperity, happiness, success, good fortune, mental clarity, emotional balance, communication, and healing to its owner. 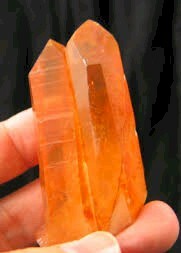 Citrines carry a very positive vibration, in tune with the Om sound, and hardly ever needs cleansing. CUBIC QUARTZ are rare and distorted crystals that seem to grow in bouts with a cubic appearance and are mostly found in alpine clefts. This same cubic shape is found sometimes in other types of stones such as fluorite, hematite, amethyst, citrine and some salts. The metaphysical powers of these cubic quartzes are not yet clear, but they tend to be considered as a sign of balance or stability. They are mostly used according to the type of mineral, not for its shape. CURVED QUARTZ usually shows lines of internal fractures and self-healing which has led to the creation of a curved pattern, as opposed to those crystals which are clearly bent from complete fracture and regrowth. 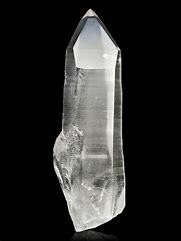 Use curved quartz in meditation as a healing crystal to build resilience and inner fortitude. Since this crystal has the ability to amplify your personal power to resist pressure, adapt, and bend without breaking, it can be used as a talisman to seek the strength you need to adapt and bend under pressure, but not to break in difficult situations. It can help you to go through difficult problems that seem unsolvable, allowing you to see with more clarity to evaluate all circumstances and find creative ways to overcome any difficulty. DENDRITIC QUARTZ is a variety of quartz that contains natural inclusions of manganese oxide that look like internal leaves or ferns. It is mostly used as a personal talisman, carried or worn when you seek to change your life and bring it more in tune with the natural rhythms of life and nature. DEVIC TEMPLE QUARTZ is an Earth Spirit Stone. These are very rare crystals which show internal fractured planes that appear to be ledges when observed horizontally and shelves when the quartz crystal is held vertically. These crystals should be used in peaceful outdoor meditations to get closer to the planet and seek the wisdom of the Earth. 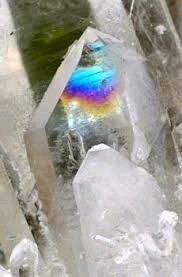 They may have beautiful rainbow inclusions of trapped air, water and gas that give them their veils, foils and frosts. 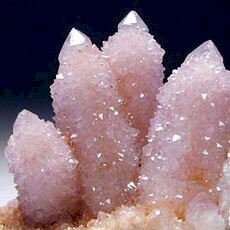 They are considered to be master crystals that provide a gateway through which higher beings can communicate with us. Their harmonizing vibration can expand consciousness and enhance our extrasensory powers. These crystals do not like to be placed indoors, to be forgotten or abandoned, or to be placed in busy or noisy environments. Under these circumstances, they will become inert or inactive and will “sleep” until better conditions allow them to manifest their power. 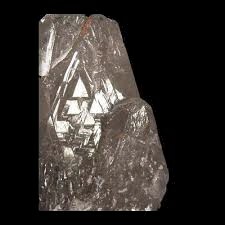 DOGTOOTH QUARTZ has a diamond-shaped with an elongated body and two opposing faces and sides fine to barely there. A dogtooth is a short, stocky crystal that has a double termination that resembles a dog’s tooth, hence the name. It is said to be a very efficient energy transmitter, used for re-balancing and centering. It can also be used as a personal talisman in negotiations when compromise and agreement are desired or required, so you can be ready to negotiate successfully. DOLPHIN QUARTZ is a host quartz crystal with a smaller aligned one, which looks like a baby dolphin riding on its mother along one of its sides, and one or both may be double-terminated. Dolphin Quartz crystals are used for sharing, enlightenment, nurturing, watchfulness, playfulness, and teaching responsibility. 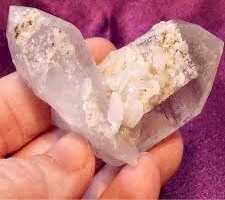 Thia type of quartz are used in meditation when one seeks to find ways to pass on knowledge to others, or to learn things that can help you guide your family or your community. As a personal talisman, they make an excellent aid to inspire us to educate and guide our children. 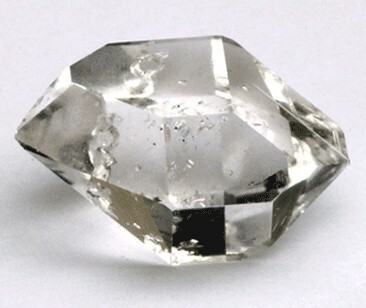 DOUBLE-DIAMOND QUARTZ is a rare type of quartz which has 2 diamond windows, one above the other. These quartz crystals are magical portals to your inner self and also enhancers of your psychic vision. Generally the lower window is the portal to your current self, while the upper window is the portal to your future self. Use these crystals to realize if your current practices and lifestyle is helping you to improve your spirituality, humanity, and kindness, which will open your doors for all future success. 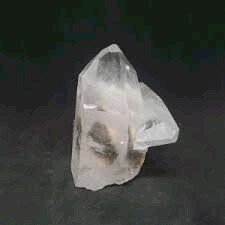 DOUBLE TERMINATED QUARTZ are both receivers and transmitters of higher vibrations, and hence used in meditation, to connect with angels and spirit guides, for divination purposes, and as personal talismans. They facilitate communication between individuals teaching us to listen as well as talk, respond as well as react, and accept as well as question. DOW CRYSTALS are recognized as having 6 faces (as always), but with 7-3-7-3-7-3 face sides. This is a remarkable and rare healing stone that combines efficiently and harmoniously the properties of the archetypes 3 and 7. Those interested in numerology or sacred geometry will immediately recognize such a structure as significant. 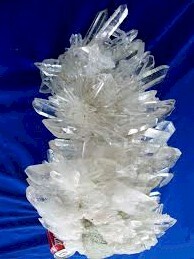 Dow crystals are the most symmetrical and balanced of all the crystals, combining the properties of both channeling and transmitter crystals, as well as exhibiting their own unique properties. In chakra healing, they act as a tuning fork that resonates with each chakra to restore their innate frequency and bring harmony to the physical, mental and emotional bodies. DUMORTIERITE QUARTZ is sometimes called "blue quartz" too due to its contrasting light and dark color zones across the stone formation. The inclusions of durmotierite within the quartz specimens often result in silky-appearing splotches with blue, purple, or gray hues. This stone teaches you to stand up for yourself, to take control of your own life, and to learn the great virtue of patience. This crystal is very stimulating to the brain and brings enhanced intellectual abilities and mental skills. It also has the most powerful effect on the root chakra, making it an inspiring energetic muse for all forms of creativity. By instilling patience and anchoring you to the earth, it sets the stage for the highest form of creative expression. These stones are rare and beautiful! 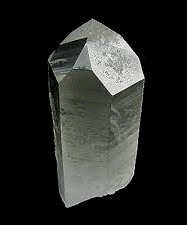 ELESTIAL QUARTZ has an extremely high vibration. These are powerful crystals that can aid in your spiritual growth. They work with the crown chakra, allowing energy from the higher planes and angelic realm to come to you. These are excellent crystals to keep nearby as they continuously receive spiritual vibrations and attune you to work with them. It is said that elestial quartz crystals comes to your life when you are really ready to handle its powerful energy. Elestials are also excellent healing tools for any skeletal issues. They are mostly found in nature in clear quartz and smoky quartz formations. This type of quartz has many natural terminations and folds over a multi-layered crystal, appearing to be and to feel wrinkled. 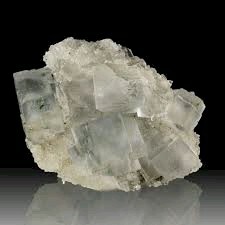 It is a young quartz in growing process and have a very strong feminine energy. ENHYDRO QUARTZ is a crystal that contains drops of water or other fluids suspended in enclosed small bubbles, and if the bubble moves inside it is then called an Enhydro Runner. Enhydro are stones of acceptance and unquestioned love. They relieve doubt, restore faith, provide self-confidence and bring peace and loving acceptance to relationships plagued by doubt, distrust, and worry. But do not pierce them! This stone should be used with caution because its structure reminds us that sometimes there is a knowledge that cannot be acquired with a certain loss. If you pierce an Enhydro quartz to get the liquid, you will destroy the crystal's uniqueness and power mixing its content with the mundane. This serves as a reminder that sometimes when you dig into the secrets of others, you risk damaging yourself with your sudden discoveries and the consequences may be irreparable, like piercing the Enhydro. It will never be the same. ETCHED QUARTZ: Etched crystals are recognized by abrasions and/or intricate indentations, often forming patterns or textures. They are used in meditation or as a talisman, and those crystals with a more complex patterning can be used for scrying. Their markings contain a transfer of information of experiences coming from the ancient Egyptian civilization, Lemuria and Atlantis in which the crystals participated. They may also contain a compilation of information related to ancient healing methods. 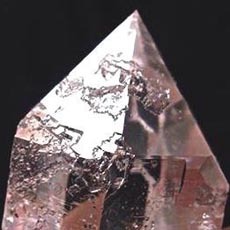 The etched quartz crystal is usually a personal meditation crystal that will transfer beneficial information to its owner for personal development and/or spiritual insight. They may also be used to obtain information to help another person who needs it. FADEN QUARTZ CRYSTALS have one or more milky and "feathery" thread lines, usually running edge to edge through the crystal. 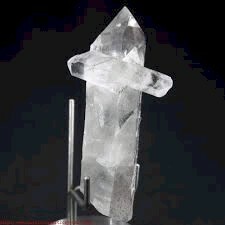 This is usually perpendicular to the crystals growth and is unique to Fadens. 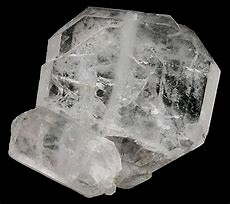 They are considered the ultimate connection crystal, helping its owner to connect with other people, with spirit guides, entities, ideas, or beings from other dimensions. 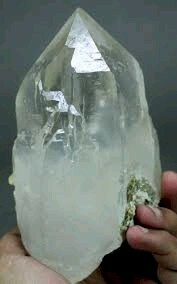 The properties of the Faden Quartz make them one of the best crystals for psychic development, communication and information retrieval of all types. They can be very useful for those with a desire to increase their perception and intuition. FAIRY CLUSTERS are groups of extremely fine, delicate, and bright crystals. There is no possibility of getting these beautiful healing stones any other way than by very careful hand mining. Their unique properties are derived from their often miniature, architectural refinement. Their high frequency can lift consciousness and allow those sensitive individuals to perceive fairies and other entities of a higher vibration. Their slender crystals are usually lasers, so they also share the properties of that formation. In chakra healing, fairy clusters are used to cleanse and dissipate unwanted energies. They have a special resonance with the crown chakra (1st). GENERATOR QUARTZ are rare to find in nature. They are also called “Center Point” because it has a point in the center and six triangular-shaped faces around. 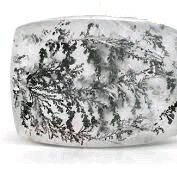 It consists of symmetrical crystals that can be used as a power source to charge with universal life force other crystals placed around it, hence the name of “generator.” Generator quartz needs to be regularly exposed to sunlight and moonlight to recharge. GOLDEN HEALER QUARTZ is recognized by their partial golden, yellow, orange, or brown transparent coating, but occasionally the minerals they contain permeate the entire crystal giving them a particular color. These are powerful and energetic healing crystals, often very beautiful. They are excellent stones to use in healing situations to enhance other alternative healing methods and techniques, which will further recoveries from a number of disorders that tend to create an energy imbalance or depletion. GROUNDING CRYSTALS are recognized as having a main face with eight sides. These crystals help maintain a pragmatic approach to life. Their grounding effect enables those with their "head in the clouds" to remain focused and grounded, instead of too "spaced out". They are useful for healers and practitioners of all energy treatments. HARLEQUIN QUARTZ is an extremely beautiful formation with amazing interiors that show red dots or strings of lepidocrocite and hematite inclusions. Occasionally they form special patterns revealing the internal energetic structures of their host crystal. They combine the properties of quartz with that of these two minerals, which being red, bring vitality to the physical body and stimulate the chakras, particularly the base and heart chakras. Harlequin Quartz can also be used to balance the polarities, stimulate the bodily meridians, and realign the nervous system. Sometimes they are also used to intensify devotional practices. HEMATOID QUARTZ, sometimes called Specularite Quartz. is a quartz crystal that contains inclusions of hematite which can create black shimmering clouds inside the quartz crystals. Fire Quartz, is a quartz crystal that contains inclusions of hematite which has reddish-brown dots or clouds inside the quartz crystals. Regardless its color, Hematoid Quartz is a grounding crystal that calms and quiets the mind and provides focus and concentration. It also helps to dissolve imbalances and negativities in your life, balances your energy field, enhances willpower, boosts self-esteem, brings a sense of self-confidence, and inspires positive and creative thinking. HERKIMER DIAMONDS are not actually diamonds, but small, double-terminated quartz crystals, with a clear and brilliant sparkle that manifests pure Light. They are powerful amplifiers of spiritual energy and perfect conduits of the universal Life Force. They are exceptionally good healing crystals, and can be used in meditation, grid work, dream and vision work, and other metaphysical uses. Being doubly terminated, they have the ability to transmit their energies, receive spiritual energy, and amplify the focus and intensity. 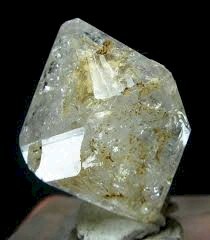 Herkimer Diamonds are harder than other quartz crystals so they inspire resilience and strength to handle difficult challenges. What they lack in physical size, they make up abundantly in spiritual energy. ISIS CRYSTALS are fairly symmetrical, but with 5 sides which is not very common. Five is the “human” number, but this crystal is closely related to Phi, the Divine ratio, the golden proportion, and the principle of human regeneration. Its name, Isis, comes from an association with the perfect proportions of the Egyptian pyramids and the presence of the feminine Goddess principle. This type of quartz crystals are used to help restore the feminine balance lost through a misuse of masculine energy, assertion, ego or power. KEY QUARTZ CRYSTALS are recognized by an indentation on the side or face of a crystal, usually six-sided since this is a specific type of growth interference caused by another quartz crystal. Meditation using this type of crystals gives you access to information from which you are normally excluded or you have no easy access to it. 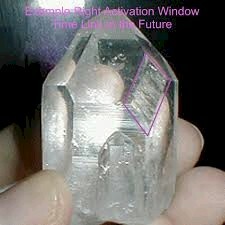 This type of quartz is used to “unlock the doors" and get access to what you need to know or wish to know. 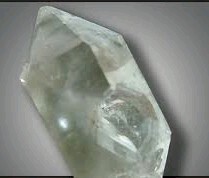 LASER QUARTZ is easily recognizable because of its relatively long and slender shape. They are an excellent crystal for developing focus and intuition in meditation. 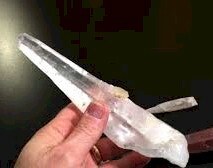 They also make excellent wands since quartz crystals naturally resonate with the intention of the user. It can also be used to clear an area of negativity, to create protective barriers, and to beam healing energy to oneself or another person. 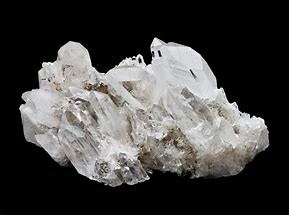 MILKY QUARTZ is the most common variety of crystalline quartz. 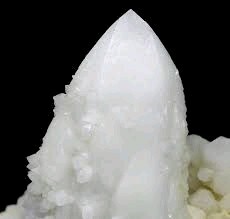 The white color is caused by inclusions of gas, liquid, or both, trapped during crystal formation. 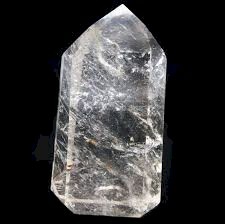 The healing properties of Milky Quartz are numerous. It is an emotional stress relieving stone, it helps to combat stress and eliminate negative energies. It also increases self-confidence, sharpens the mind, and enhances public speaking skills. Milky quartz is often responsible for the cloudy phantoms inside of otherwise clear rock quartz, amethyst, citrine or smoky quartz. PHANTOM QUARTZ is a variety of quartz or "rock crystal" that forms over pre-existing crystals. They have smaller images of themselves within the body of the main crystal. Phantom Quartz gets its powerful healing vibration from rare and unique formations created from interruptions in their growth. 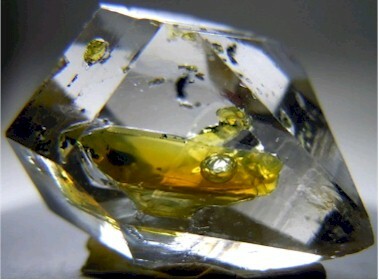 The blockages help create concentrated mineral deposits, which form in distinctive ghost-like shapes within the crystal. These dreamy phantoms all have their own story, bringing messages of wisdom and truth. They can be used as healing crystals and in meditation to get in touch with your inner self or to achieve self-knowledge. QUARTZ CLUSTERS are crystals grouped on a common matrix. Where there is no matrix the crystals bridge together. These are wonderful healing crystals with a sense of community, which create harmony and remove negativity from wherever you place them, on your body or in a room. The energy of this cluster easily removes blockages and strengthens the all the chakras. The same properties make them the first choice for cleansing and activating other healing stones. Quartz clusters bring their energy to the surrounding environment, enhancing harmony and peace in the family, in groups, or in other social or business environments. They can be used to communicate with minerals, plants, animals, and higher beings. RAINBOW QUARTZ contains inclusions or internal cracks that show a rainbow when viewed from a certain angle. They are seen as crystals of happiness, inner joy, optimism, and understanding, which help us see beauty in our everyday life. They are frequently used as talismans, and are also excellent as meditation crystals to combat loneliness and deal with heartbreaking situations and disappointments. They can also be used for spiritual healing, and are particularly good when facing grief or sorrow to realign with the universal life force. RECEIVER QUARTZ is a crystal with a broad sloping face. When we are good communicators but poor receivers, this type of quartz can come to our aid. We frequently use quartz crystals to seek communication with the angels and the spirit world, but we may not necessarily be good listeners. 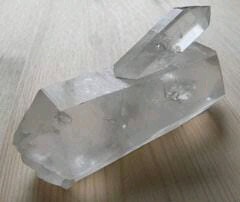 A receiver quartz will assist you to open your channels and enhance your capacity to listen and to receive signals from higher entities or angelic beings. 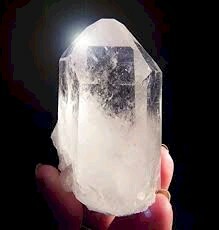 This is an excellent crystal for an enhanced meditation. 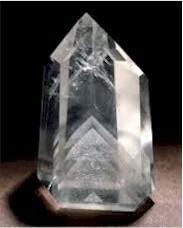 RECORD KEEPER QUARTZ is a crystal that has clearly etched pyramid shapes on its termination faces. They are believed to be special containers of compiled wisdom. Each record keeper seems to contain different knowledge and to provide us with unique understanding of basic universal truths. Use them in meditation with an open, receptive, and non-judgmental mind, without seeking answers to particular questions or expecting specific results so you can allow the crystal to speak to you without you exerting an influence on it, and you will receive astounding insights. RED PHANTOM QUARTZ are usually of a scarlet red color due to its composition, but may also show shades of black, brown, blue, or violet. Red Phantoms are used as meditation crystals to develop our appreciation of the physical world and to grow our physical energy. These crystals are a natural source of energy and vitality which lead us to find pleasure in love, life, and human relationships. ROSE QUARTZ is a variety of quartz stones which may appear in nature from a pale pink to a rose red hue, depending on the trace amounts of other minerals present. 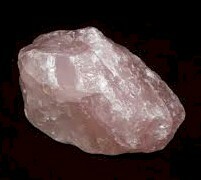 Rose Quartz is the stone of unconditional love, determination and commitment. It holds a romantic energy that has the ability to attract love into your life by opening your heart chakra to attract more harmonious and loving relationships. The soothing energy of Rose Quartz fosters empathy, reconciliation, and forgiveness of others. It can help in meditation by lowering stress and tension so you can enter in a deeper state of relaxation. Rose Quartz has been used since ancient times in love rituals and ceremonies and remains to this day the best stone for love and lovers. 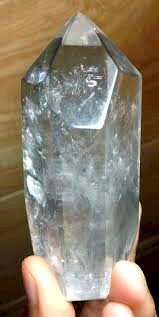 SELF-HEALED QUARTZ. As the name states, these are healed and healing quartz crystals, which have suffered conditions that affected their growth or structure, but they managed to heal and continue growing. These quartz crystals show some lines which indicate their attempts to repair themselves. Healers use these powerful crystals to bring the universal life force to people who are in need of repairing their lives, physically and/or emotionally, to help them go on with their lives and continue their spiritual growth. 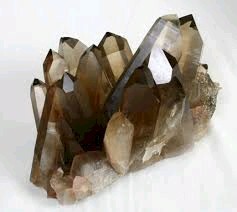 SMOKY QUARTZ is a brownish or gray translucent variety of quartz. It ranges in clarity from almost a complete transparency to a beige or brownish-gray crystal that can be almost opaque, and some of them can also be black. It gently heals emotional conditions and traumas, help to overcome lack of trust, and supports one in coping with stress and strain. 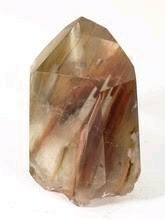 With its subtle shades of brown or gray, Smoky Quartz crystal healing properties work to reconnect us to the earth, making it one of the best stones for grounding and balancing. 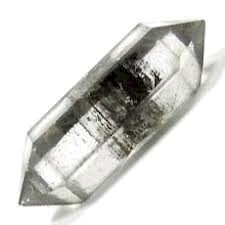 You can also get the most out this master healer by taking a Smoky Quartz crystal point and placing it over areas of tension to neutralize negativity. 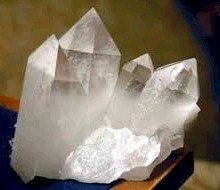 This type of quartz can also amplify the energy of other crystals placed around it. 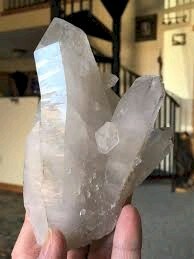 SPIRIT QUARTZ. These types of quartz formations, which may show some variations in color, are also known by the names of Spirit, Candle, Cactus, or Pineapple Quartz. They are essentially the same formation with some variations in their final look. For chakra healing, the ones with a delicate purple color resonate with the crown chakra (7th), the subtle pink shades with the heart chakra (4th), and the brown and grey tones with the base chakra (1st) for grounding. This means that the use of Spirit Quartz crystals depend not only on the type of quartz formation, but on their color and composition. They may also share some of the multidimensional properties of the elestial quartz, with the abundance of the barnacle formations. Overall, they are excellent crystals for information retrieval and meditation, and the ones with spikes can be used as protective or shielding stones. 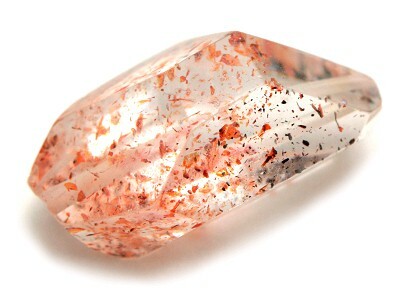 TANGERINE QUARTZ gets its name from its typical color, which ranges from orange to shades of red. 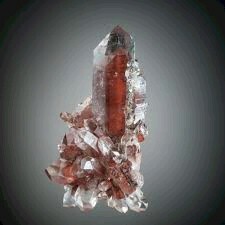 It is formed in conjunction with water and hematite, an iron stone that rusts in water giving its color to clear quartz crystals. This is a very helpful stone to carry with you when facing situations of chaos and high drama, as it can raise your vibration and get you above stressful situations. Tangerine Quartz also estimulates the joyful energy of the inner child, encouraging playfulness and curiosity, and allowing us to learn and to grow. It activates passion on all levels, from creativity to sexuality, and helps to encourage self-acceptance and overcome limitations. TIBETAN QUARTZ is a Master Healer crystal that comes from the high Tibetan mountains. It can help to manifest divine health and harmony by clearing and cleansing your aura, while grounding you at the same time. 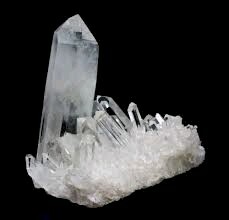 It is a very protective and spiritual crystal to keep in your home and surroundings to impart its high vibration. 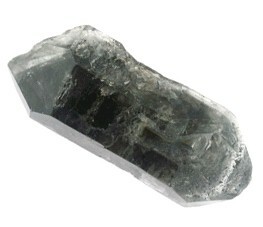 It is very similar to the Tibetan Black Quartz but clearer, which follows. TIBETAN-BLACK-QUARTZ is a high vibration crystal original from high altitudes in the remote and spiritual Himalayan Mountains, is among the most powerful protection crystals on earth. It is not all black in color, but rather a clear quartz crystal that contains black deposits of material that creates beautiful layers and veils within the quartz. It is used against psychic attacks, and it will keep you away from harm on both a physical and a psychic level. The healing energies of the Tibetan-Black-Quartz can cleanse and purify you, as well as the environment you are in. It will remove harmful energies replacing it with more positive vibrations, help you to remain centered, and illumine your mind with a deeper understanding.